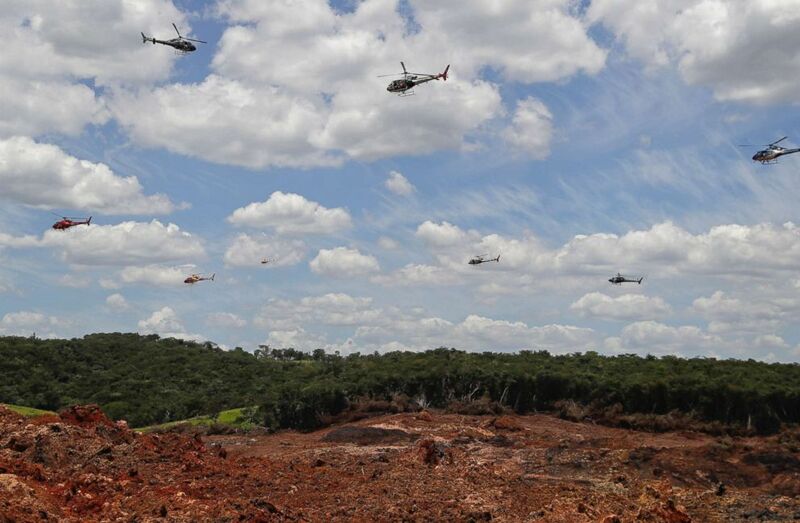 (Andre Penner/AP) Helicopters hover over an iron ore mining complex to release thousands of flower petals paying homage to the 110 victims confirmed killed and 238 who are still missing after a mining dam collapsed there a week ago, in Brumadinho, Brazil, Feb. 1, 2019. A videocamera in Brazil captured the moment when a deadly, waste-filled wave of mud, triggered by a dam collapse, began moving toward the city of Brumadinho, in the southeastern part of the country. The deadly disaster occurred Jan. 25 at an iron-ore mine owned by Vale, a Brazilian mining company. Brazilian authorities said at least 110 people had been confirmed dead and at least 238 people remained missing, according to The Associated Press. The camera, according to BandNews TV, was on top of a crane at the mine and captured the scene after the dam breach, which unleashed a massive wall of muddy, mine waste. The sludge could be seen slowly surging toward the city, eventually taking over adjacent homes and farms, and ultimately burying parts of nearby city Brumadinho. In a statement on its website, Vale said on Thursday that it was offering $100,000 in local currency to each family with relatives who’d been killed, or were missing, and providing funeral assistance. By Friday, the company said it was expanding its financial assistance to residents "who lived or carried out any rural or commercial activities in the Self-Saving Zone (ZAS) of the Emergency Action Plan for Mining Dams (PAEBM)." "Dikes will be built in the Brumadinho mine area with the aim of containing sediments from the tailings. Moreover, the installation of a barrier for sediment retention near the water catchment of the city of Pará de Minas and the construction of a sediment containment barrier in the Paraopeba river will be concluded today," Vale said.